Do you want to go salmon and halibut fishing in Ketchikan Alaska? Alaska Strike Zone Sportfishing is locally owned and operated fishing charter, we take pride in being one of the largest and oldest fishing charter companies in Ketchikan, AK. Our fishing excursions have used Knudson Cove Marina for over 19 years. This prime location is one of Alaska’s premier salmon and halibut fishing tours and offers anglers easy access to some of the best coastal ocean fishing in the world. Enjoy four hours of Ketchikan salmon fishing. During your private fishing excursion, you’ll fish for king salmon, coho salmon, pink salmon and/or chum salmon. 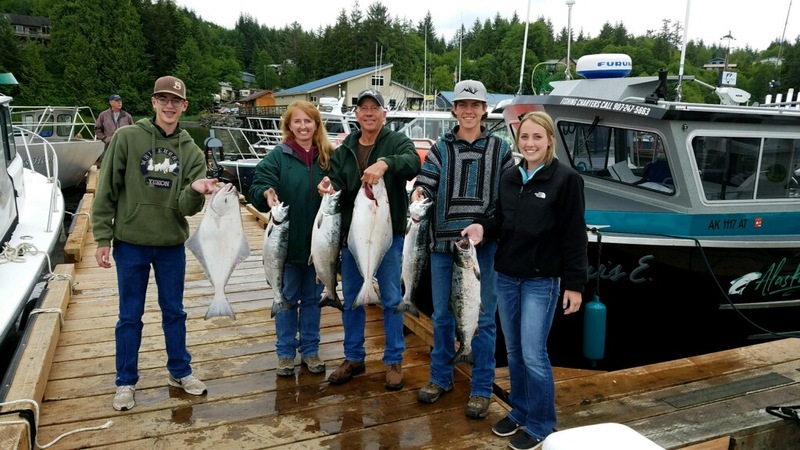 Do you want to go salmon or halibut fishing in Ketchikan, Alaska? Our charters make it easy for even the first time sport-fisher to enjoy a real Alaska fishing experience. Enjoy a private day of salmon and halibut fishing. Our experienced guides have high catch rates and will teach you all (well, maybe not ALL), of their secrets. For your convenience, Alaska Strike Zone will pick you up at your ship in our comfortable Ford Transit. Our cruise ship fishing excursions will make the most of your time in port. Book directly with us and save money. Got some extra time? Check out our list of the top five things to do in Ketchikan. Delivering a quality Alaskan fishing experience to our guests is our passion and we have a top-notch team. This really was one of the best things we did on our Alaskan cruise. There were 4 of us on the boat and we caught 6 Silver Salmon and a Pink Salmon. Our captain made the experience relaxing and successful. The scenery was outstanding and we saw lots of eagles. I would highly recommend Alaska Strike zone to anyone wanting a good time fishing! I was extremely pleased with my experience on the boat “Island Time” with Ben and Taylor. The made sure everyone on the boat had multiple chances to catch salmon which made it a very enjoyable and exciting trip. I will never forget pulling in my first silver salmon and the excitement of it all. Alaska Strike Zone was 100% professional from step one! Our expectations were exceeded greatly. We chartered 3 different boats with 4 family members on each boat. All 3 boats and all 12 family members landed a Silver or more! Our Captain was amazing and extremely knowledgeable. Will for sure book again with the Strike Zone! Go Halibut & Salmon Fishing in Alaska!